When should I get the flu vaccine? Why do I need it every year? The best time to get vaccinated is in late May or in June because although protection usually lasts a year, in some people vaccine protection may wane more quickly, around three to four months after getting immunised. 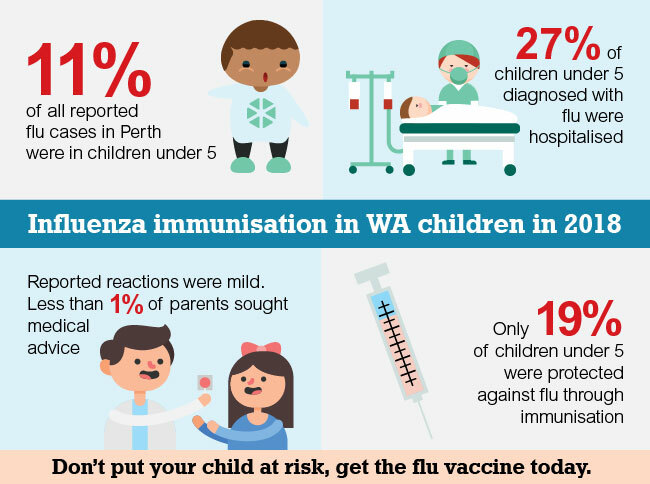 Getting vaccinated around late May/June will ensure you are protected throughout peak flu season, which in Western Australia is usually August/September. Note, after vaccination it can take up to two weeks to develop protection. The flu is more common than you may think. 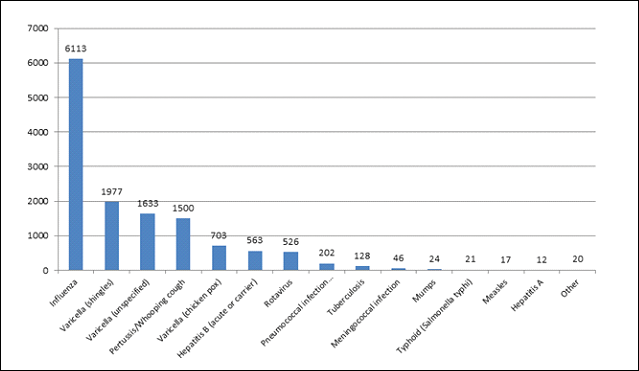 It’s the highest notifiable vaccine-preventable disease, see graph below. How can people reduce the spread of flu? The flu is highly contagious. It spreads easily through droplets from coughing and sneezing. These droplets can settle onto hard surfaces, e.g. doorknobs, and can then pass from hands to nose, mouth or eyes. Flu spreads even more quickly among large groups e.g. childcare centres, aged care and healthcare facilities. Infection rates can be two to three times higher in these circumstances. Vaccination is the single best way to prevent the spread of influenza. avoiding touching your eyes, nose or mouth as that is how the disease is commonly spread. I'm healthy and rarely get sick. Why do I need the flu vaccine? Even otherwise healthy people can get very sick from flu. Most healthy people who get the flu are quite sick for a short time, but generally recover well. However some people are at greater risk of influenza complications, especially the young, elderly and those with medical conditions. Getting vaccinated helps to protect these vulnerable groups. If you don’t catch the flu, you can’t pass it on to others. Children who become infected with flu can develop serious illnesses, including convulsions (seizures or fits) and diarrhoea.The majority of childhood flu-related hospitalisations and deaths occur among children without underlying medical conditions. Is there anyone who shouldn't get the vaccine? The only reason not to have the flu vaccine is following a severe (anaphylactic) reaction to a previous dose of flu vaccine, or to any component of any vaccine. Speak with your GP or immunisation provider for advice. Allergic reactions to flu vaccine are rare. If you are unwell, talk to your doctor about whether to reschedule your vaccination. You should also tell your healthcare provider if you have ever had Guillain-Barré syndrome (GBS, a severe illness causing muscle weakness). Your doctor will help you decide whether the vaccine is recommended for you. People with a history of GBS have an increased likelihood in general of developing GBS again, and the chance of them coincidentally developing the syndrome following influenza vaccination may be higher than in persons with no history of GBS. Diagnosis of GBS is complex and must be made by a physician. Can I get the flu vaccine for free? Note: The vaccine is free however you may be charged a consultation fee. Check costs when making an appointment. Is the flu vaccine safe? What are the risks? Yes. Any medicine, including the flu vaccine, can have potentially serious side effects, such as severe allergic reaction. However the risk of the flu vaccine is extremely small. AusVaxSafety is a national program to monitor the type and rate of reactions to each year's new influenza vaccine. AusVaxSafety data shows more than 93 per cent of people who received the flu vaccine in 2017 had no reactions. Those who did have a reaction had mainly local reactions at the injection site (2.3%), fever (0.9%) and rash (0.2%). Learn more at NCIRS (external site). All vaccines available in Australia must pass strict safety testing before being approved for use by the Therapeutic Goods Administration (TGA, external site). Find out more about vaccine safety. Can I catch influenza from the flu vaccine? No, it is not possible to get the flu from having the flu vaccine. The vaccine contains particles of killed viruses which cannot cause influenza. Some people experience vaccine side effects such as pain, redness and swelling at the injection site, low grade temperature, muscle aches and/or drowsiness. It is possible to be exposed to influenza viruses shortly before getting vaccinated or during the two week period after vaccination that it takes the body to develop immune protection. This exposure may result in you becoming ill with the flu before protection from the vaccine takes effect. People may also mistake symptoms of other respiratory viruses for flu symptoms. The influenza vaccine only protects against influenza disease, not other illnesses. In 2018, a two year trial (external site) starts that allows people aged over 65 years to get the flu vaccination at some pharmacies. If you or your child start to develop a fever after a vaccination, take or give your child paracetamol as directed on the manufacturers recommendation – this will depend on your weight and age. Contact your doctor if high fever (over 38.5 C) persists or if you are concerned. Drink extra fluids and wear light-weight, loose clothing. What can I do if I am unwell or have an adverse reaction following flu vaccination? Stay home from work/school if you have a flu-like illness to avoid spreading the illness to others. Seek medical advice if symptoms continue or get worse. If you are travelling, check Smartraveller (external site) for travel advice about international influenza outbreaks. Travellers should consider getting the flu vaccine before travelling to countries with influenza outbreaks.